Ideal for taking steady videos with your iphone this lightweight tripod grips your IPhone and allows for a full 360 degree pan and swivel. Designed for the All Apple iPhone models. 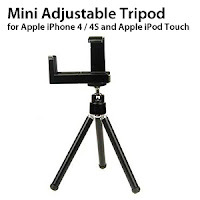 This is an excellent value for money item , and very useful to have with you. it is extremely light, and has extending legs, I have to remove case to put in holder, but it is held securely. it would have been nice if you could have fitted the head to a standard tripod, but perhaps that facility will follow at a later date!